For an island that is no bigger than the size of Maine, charming, visually addictive Ireland has endless sights to discover. If your New Year’s resolutions include a hop across the pond, creating an Emerald Isle trip itinerary can be almost as daunting as driving on the wrong side of the road. Key planning points to consider are length of stay, transportation mode, travel distances between points, time of year, and your must-see sights or activities. To get you started, here is an insider’s guide to many of the Republic of Ireland’s most popular places along with lesser-known jewels, many of which are best accessed by car. 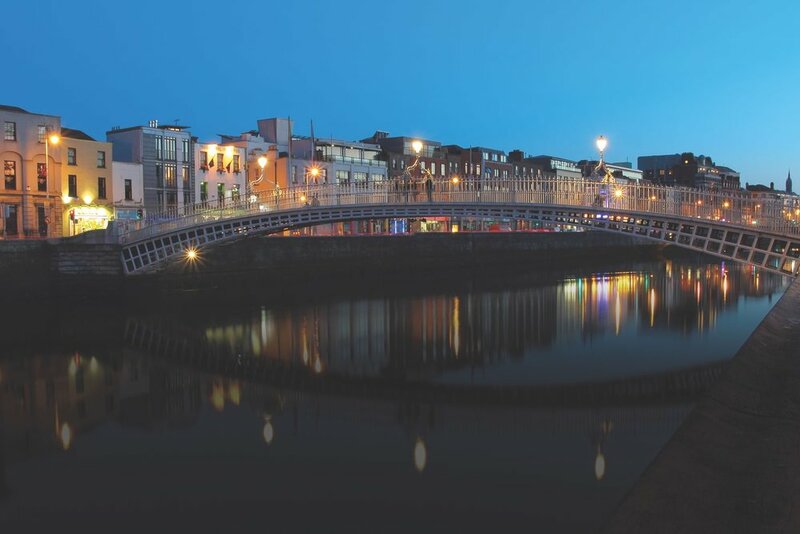 Ireland’s friendly capital, Dublin, has a rich history with a cosmopolitan vibe, deftly blending the past and present into one delightful destination. The Shelbourne is Dublin’s original grande dame hotel and features Waterford crystal chandeliers, a genealogy butler, and the Lord Mayor’s Lounge, where Ireland’s president, Michael D. Higgins, drops in for afternoon tea. This luxurious 1824 landmark overlooks St. Stephen’s Green and is where the Irish Constitution was drafted in 1922. Dublin is an excellent walking city, and not just because it boasts Ireland’s mildest and driest weather. (Winter temperatures are sometimes warmer than Northwest Florida’s.) From the Shelbourne, stroll a few blocks past ivy-clad brownstones with brightly painted doors to pedestrian-only Grafton Street in the city center. Redbrick pavers and colorful flower stalls add panache to Grafton’s chic collection of restaurants and boutiques and Ireland’s nicest department store, Brown Thomas. Veer west a few blocks to Stephen Street Lower and find the Hairy Lemon, a convivial pub that pays tribute to a local dogcatcher from the1950s, a man whose face supposedly resembled a lemon with gooseberry-like stubble. Relish the quintessential ambience, the friendly craic, and the lamb shank with potatoes and “mushy” green peas. If it happens to be Christmas Eve, return to Grafton Street and keep a lookout for Dublin’s most famous street performer—and U2’s lead singer—Bono, who for the past five Christmases has busked for donations to a charity that serves the homeless. Music has always been a big part of the Irish culture. In fact, Ireland is the only country whose national symbol, the harp, is a musical instrument. 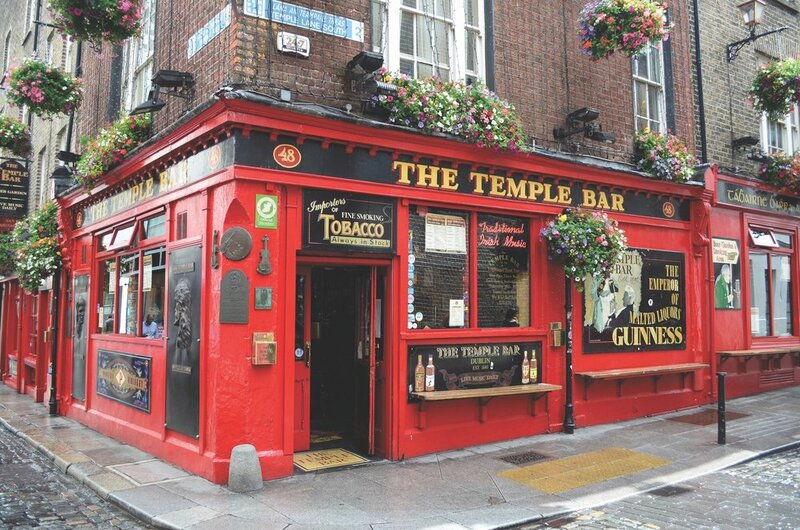 The Temple Bar district is Dublin’s version of the French Quarter: it is a major nightlife center with boisterous bars and plenty of live Irish music. One of the area’s best is the Oliver St. John Gogarty, a high-spirited pub and hostel on the corner of Fleet and Anglesea Streets. Gogarty’s, named for one of Dublin’s many colorful literary figures, hosts live music and merrymaking until the wee hours—forget about sleeping. The fourth floor bar is also the meeting place for Dublin’s highly acclaimed Musical Pub Tour, which is led by witty musicians who provide attendees with a crash course on Irish music in between pub stops. For authentic, traditional Irish music, known simply as “trad,” venture away from the touristy Temple Bar area and hang with Dubliners at Devitt’s on Camden Street. Its famed open sessions, held Thursday through Saturday nights, are typically acoustic Upstairs, seated around several regular pub tables topped with pints of Guinness, you’ll find eight to ten musicians elbowing one another with fiddles and accordions as their mercurial tempos fluctuate from “Danny Boy”-style ballads to frenetic Riverdance-type rhythms. Dublin’s roots are entrenched in ancient Celtic history. They began in a black pool (or dubh linn in Irish) that was formed at the confluence of the Liffey and Poddle Rivers, where Vikings built a fortress in 841 A.D. Dublin Castle, whose large gray stones have withstood eight hundred years of the city’s sometimes tumultuous history, rests atop the original settlement, although the moat’s black waters have long since receded. Irish towns that begin with the letter K are as common as the surnames Ryan and O’Brien. Kilkenny has been called Ireland’s most charming medieval town, and thanks to Ireland’s improved interior roadways, Kilkenny is just a couple of hours away from Dublin. It is also home to red ale royalty: Smithwick’s (pronounced “Smiticks”). Explore the main street, lined with colorful eateries and shops, and cross over the picturesque John’s Bridge, where Kilkenny Castle stands sentinel. Grab a bite at Langston’s before continuing another ninety-five miles to the city of Cork. If nightfall is approaching, Cork makes a great overnight stop. Some dismiss Ireland’s second largest city as just gritty, but dig a little deeper and uncover its hidden gems. Garnish House, situated on Cork’s western outskirts near University College Cork, offers quaint rooms in the main house and legendary breakfasts, including fresh fish, warm scones, and porridge topped with Baileys. Cork has a long rebellious history, such as its anti-Guinness allegiance to the local brews: Murphy’s and Beamish stouts and Rebel Red Ale from Franciscan Well. Ask for a “home and away” in a pub and you’ll be served a pint of Murphy’s and a pint of Guinness. Follow the heritage pub trail through downtown’s historic district and discover Cork’s oldest, most atmospheric watering holes. Arthur Mayne’s is a candlelit Victorian chemist shop turned wine and tapas bar complete with vintage pharmaceutical memorabilia. The next morning, browse downtown’s ornate English Market, brimming with plenty of local produce and colorful characters. Afterward, you could join the hordes at nearby Blarney Castle and hang by your ankles to kiss a saliva-slathered stone. Or—drive fifteen miles down to Ireland’s scenic southwestern coast. Tucked between rolling hills and a crescent harbor speckled with bobbing fishing boats lies Kinsale, a picture-perfect seaside village and gastronomic haven. Stroll Kinsale’s winding cobbled lanes trimmed with cute-as-a-button boutiques, like Boland Craft and Gift Shop, which sells art, jewelry, and quality woolen goods. Kinsale, the Gourmet Capital of Ireland, has a wonderful assortment of gastropubs and gourmet restaurants: Fishy Fishy, Jim Edwards, and Max’s are among the finest. The Blue Haven, a popular downtown hotel, serves award-winning seafood chowder. The White Lady Inn is less central but has a very reputable kitchen and offers contemporary, affordable rooms. Besides dining and imbibing, Kinsale offers fishing, sailing, seasonal whale watching, and golfing—a popular pastime throughout Ireland. Kinsale’s Old Head Golf Links is reputed to be Tiger Woods’s favorite Irish course and was named one of the world’s best by Golf Magazine. Even on a chilly, drizzly day, take the Scilly Walk, an undulating pedestrian path that winds around Kinsale Harbor and along the sea to Charles Fort. On the way back, refuel with fish-and-chips at the Bulman in teensy Summercove. Then get your gab on with the regulars at the Spaniard Inn, a legendary pub perched atop Compass Hill that feels like an old pirate haunt. If you’re staying in Kinsale, The White House makes for a closer stumble back after a late night of Irish music. Some of the greenest fields and hillsides you’ll ever see line the drive along N22 between Killarney and County Clare. Before arriving in ultratouristy Killarney, stop off at splendid Killarney National Park. Take a tour of the stately nineteenth-century Muckross House and Gardens and explore the national park’s lovely lakeside lanes via horse-drawn buggies known as “jaunting cars”—motorized vehicles are prohibited. In neighboring County Kerry, the famed Ring of Kerry is one of Ireland’s most popular attractions. The 110-mile cliff-clinging drive around the breathtaking Iveragh Peninsula can be done as an easy day trip. Tip: Rather than snail behind a convoy of tour buses, drive counterclockwise on N70 from Killorglin to Kenmare. Both towns provide ample accommodations and restaurants away from congested Killarney. A shorter alternative to the Ring of Kerry is the Slea Head Drive, a thirty-mile loop around Dingle Peninsula. Boasting scenic coastal vistas, this slower-paced, circuitous course begins and ends in Dingle (An Daingean in Gaelic), a town with beautiful beaches and buzzing pubs. Shannon in County Clare is home to one of Ireland’s international airports. Numerous castles and renowned natural wonders are also close by. A few miles from Shannon Airport, dreamy five-star Dromoland Castle stands regally and makes a fit-for-royalty stay. Fifteenth-century Bunratty Castle features fortress tours, touristy medieval banquets and a folk park—picture an Irish Williamsburg. And, dig deep into Ireland’s past at the restored fifteenth-century Dysert O’Dea Castle, which is an archaeology center and museum. Each year thousands brave the narrow nail-biter drive along R478 from Ennistymon to the soaring Cliffs of Moher (pronounced “More”), one of Ireland’s most photographed places. Expect crowds and frigid, blustery winds as you gaze across five miles of jaw-dropping bluffs that dramatically plunge into the churning Atlantic. Return to Ennistymon and turn on N67 north for a scenic corkscrew route through County Clare’s beautiful countryside. Pass through quaint Lisdoonvarna, home of Ireland’s famed Matchmaking Festival, before reaching Burren National Park. The Burren can best be described as a stark, striated limestone landscape. Stretch your legs or take a hike on the windswept hills that span ten square miles. Lovely Kinvara makes a great place to stop between Shannon and the city of Galway. Have a pint at Sexton’s Pub before heading to the Pier Head for fresh seafood and views of Kinvara Bay and Dunguaire Castle. The city of Galway in County Galway is just three hours away from Dublin via the not-so-scenic M6/N6 motorway. Western Ireland’s unofficial capital (population 75,000) is an artsy university town with a trendy medieval quarter and thriving trad music scene. Galway is famous for its oysters and Ireland’s symbolic Claddagh (clad-uh) ring, which originated nearby and depicts two outstretched hands (friendship) holding a heart (love), topped by a crown (loyalty). Hotel Meyrick, an elegant landmark overlooking Galway’s famed Eyre (pronounced “Air”) Square, exudes old-world sophistication and has hosted dignitaries since 1845. For chic accommodations with an Austin Powers-meets-Audrey Hepburn style, stay at the ultratrendy G Hotel, a fifteen-minute walk from the city’s center. One of Galway’s best restaurants is Ard Bia at Nimmo’s, which is nestled behind the Spanish Arch in a centuries-old stone house overlooking the River Corrib. The award-winning café and wine bar specializes in seasonal organic produce, fresh seafood, and mouthwatering cakes and tarts. Stroll around the corner to Galway’s medieval Latin Quarter, packed with trendy shops and pubs, like Tig Coili and Taaffes Bar, that pulse with riveting Irish tunes. For an intense, “unplugged” session, seek out the Crane Bar in the southwest part of the city and snag a stool upstairs for a rare treat! Galway is also the gateway to Connemara, Ireland’s untamed wild west, which begins just beyond the city fringes, but feels worlds apart. This borderless region is the Old Sod, a harsh backcountry that stretches across County Galway to the Atlantic’s craggy beaches and is blanketed in rocky outcrops, ancient peat bogs, and a smattering of small towns and villages. Connemara is home to Ireland’s highest concentration of Gaelic (the traditional Irish language) speakers—the brogue tends to be a wee bit thicker here—and to the Connemara pony, which is world-renowned for its hardiness, good work ethic, and mild temperament. The charming village of Cong is situated northwest of Galway near the County Mayo-Galway border. For millions of Yanks, Cong was their first glimpse of Connemara, which is where the 1952 Oscar-winning movie The Quiet Man, costarring John Wayne and Maureen O’Hara, was filmed. Situated on serene Lough (lake) Corrib is Cong’s other claim to fame, stunning Ashford Castle, one of Ireland’s most opulent five-star hotels. Cross over the drawbridge to the eleventh-century fortress, where fairy tales come true—at least for a night or two. Quaint Letterfrack is situated along Connemara’s western coast and is known as the portal to Connemara National Park, the region’s most visited attraction. Diamond Hill is a popular hike within the park’s five thousand acres of unspoiled, raw beauty. The arduous hour (or so) ascent up to the 1,300-foot summit rewards climbers with spectacular 360-degree panoramas of glistening Ballinakill Bay to the west, the jagged peaks of the Twelve Bens (or Twelve Pins) to the south and east, and lovely Kylemore Lough to the north. Nestled between hilly woodlands and Kylemore Lough’s mirrorlike waters is Letterfrack’s other breathtaking gem, Kylemore Abbey. Kylemore was built in the 1870s as a magnificent neo-Gothic private estate and was later converted into a Benedictine monastery and convent boarding school. Daily tours are offered, which include the beautiful grounds and the colorful Victorian Walled Gardens—a must-see. Kylemore Abbey in Connemara, County Galway. Kylemore Abbey was originally built in the 1870s as a private residence but has been a Benedictine monastery since 1920. Experience refined country living at one of Connemara’s historic manor house hotels. Tucked near the national park entrance and overlooking Ballinakill Bay and Diamond Hill, lovely Rosleague Manor, built in 1820, is an ivy-clad Georgian mansion that features spacious rooms, a Michelin-starred restaurant, and a Victorian conservatory. In 1883, Irish writer Oliver St. John Gogarty opened Renvyle House on a150-acre seaside estate near Renvyle, which includes stunning views, simple rooms, a golf course, and award-winning cuisine. Nineteenth-century Ballynahinch Castle is hidden within a 450-acre woodland estate near Recess. This relaxed four-star hunting and fishing lodge offers tasteful rooms, exquisite fine dining, and views of the Owenmore River and the Twelve Bens. Explore Connemara’s secluded southwest coast and discover picturesque Roundstone. The nineteenth-century fishing village clings above a crescent-shaped harbor flecked with small wooden boats called curraghs. Remote Roundstone is also a mecca for talented artists and craftsmen, including Malachy Kearns, Ireland’s revered master bodhran (traditional Irish drum) maker. Drop by Roundstone’s best pub, O’Dowd’s, for grilled salmon or shepherd’s pie washed down with a “kit” (a pint of Guinness and a shot of Irish whiskey). Undulating Sky Road delivers awe-inspiring panoramas of Clifden Bay and its tiny neighboring islands, before unfurling into Clifden’s lively downtown square. Situated midway between Letterfrack and Roundstone, Clifden is Connemara’s largest town (population 2,000) and offers the region’s best collection of shops, restaurants, and pubs. Shop classy Millars for designer town-and-country fashions and gifts. Snag a table at affable E.J. Kings, which has live music most evenings, or trendier Mitchell’s Seafood Restaurant. Afterward, dance an Irish jig a few doors down to Lowry’s Bar, Clifden’s legendary hot spot for late night traditional music and tasty Irish coffee. Whether you take the high road, the low road, or the road less traveled, the Emerald Isle is bound to captivate you with its ravishing scenery, intriguing culture, and engaging, quick-witted Irish people. Go ahead and give it a whirl. And, may the luck of the Irish be with you.